This weekend was all about Valdis Ronis! I went canvassing with Valdis’s daughter, Shanyn on Sunday. I put my money on her being the Doorbell Queen for his campaign! She’s tireless, enthusiastic, and rings a mean doorbell. On Monday, we met up again to celebrate Valdis’s 52nd birthday! There was a great crowd, including two elected officials, lots of familiar faces, and a crew of people I’d never met before. I love when a campaign gets people who are not normally involved in politics to join in the effort! Speaking of familiar faces, Marlene Barney has a blog. Check it out! It’s nice to see the Obama Administration going on electoral offense, process-wise. Specifically, pushing for immigrants who are eligible to become citizens to take that step and become citizens, and of course with citizenship, get the right to vote. The multilingual effort aims to reach roughly 7.9 million immigrants who are eligible to file applications to naturalize but haven’t done so. Many immigrants work, raise a family and go to school while holding green cards and only think about citizenship when they need to travel or abroad or when elections roll around and they can’t vote, immigration officials said. Given the process involved with gaining full citizenship, this is less a play for 2012 (which seems to be looking better for the President’s re-election prospects) than 2016, a year in which Florida will (as always) be critical, and depending on population and political trending, Texas may actually be in play for the Democrats. This is just smart politics. The immigrant population overwhelmingly supports Democratic candidates, and the process of gaining citizenship is one likely to get them energized and engaged in the political system. And best of all, this is good for the country, as those citizens are given a stake in the nation’s future with their rights, and such long-term thinking is what we need right now. Great move by our President’s Administration. Oops! We missed LP’s first anniversary! LP went live a year ago on May 11. And we totally missed the opportunity to thank you all for reading and commenting. So I’m thanking you now. Thank you for your comments, thank you for your guest posts, thank you for your feed-back. Thank you also, for sticking with us as we worked out the kinks of having a shared blog. We’ve had 420 blog posts, 1,327 comments, and 16 guest posts. Not bad for a bit over a year! Thank you again for making this year one of great discussions. Over at Loudoun Times Mirror, writing about language. 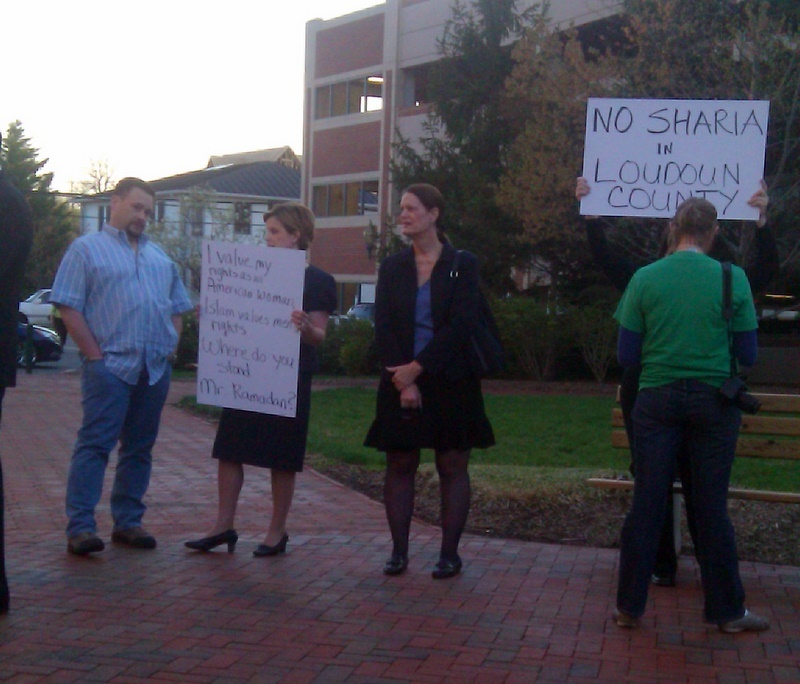 I’ve been told that a woman named Barbara Dixon announced her intent to run for School Board at Monday night’s LCRC meeting, pledging among other things to save our children from the “homosexual agenda.” Barbara is also the only known LCRC member to have openly joined the little “Virginia Anti-Shariah Task Force” protest held at the April meeting. The following video contains some other suggestions Barbara may find helpful to her campaign. Enjoy! There are many dumb laws on the books. So many, in fact, that there are several popular websites whose sole purpose is to feature the most idiotic laws in each state. One state is on its way to passing a law so ridiculous that the youtube video mocking it has already received over 800,000 views. The Tennessee Senate, continuing a long and glorious tradition of creating laughable-if-it-weren’t-so-hateful legislation, has passed what has been coined the “Don’t Say Gay Bill.” For those who aren’t familiar, SB 49 makes it a misdemeanor for a teacher to acknowledge that gay people exist in prepared materials or instruction. On one hand, the absurdity of the bill cries out for the kind of comic relief Mr. Takei so brilliantly delivers in the video above. On the other, this cynical pander to extremists is yet another hateful attempt to vilify the LGBT community. Public Advocate’s pivotal last minute role in the historic vote to defend the family held in Tennessee last week began with an email from PA President Eugene Delgaudio on Thursday May 12 at 5:26 p.m. Eastern Standard Time from his offices in Falls Church, Va. to his top volunteers and staff. (quote) Public Advocate has a Nashville based- volunteer in Nashville right now pushing passage of the bill (Director Mark Clayton) in Tennessee right now and on site in the capitol until this battle is over…..our plan is to explain to every Senator our memberships’ support for passing this bill and to stand up to the lies of the homosexual lobby and know that we are with them. Considering his recent essays on TSA pat downs and Tampa’s Gasparilla Pirate Festival, it’s certainly not surprising to see Delgaudio draw attention to his frenzied opposition to gay rights. What is particularly disturbing about his support of this bill is that it is indicative, in my opinion, of the type of laws he’d like Loudoun County to pass. Should he return to a board that is more aligned with his ideology, the extreme agenda he will try to implement will be no laughing matter. The Democratic Legislative Campaign Committee is the arm of the Democratic Party that works to elect Democrats to state (and commonwealth) legislatures. This critical, but little noticed, piece of machinery is responsible for tracking election results for a huge number of elections, every year. Because of the sheer number and variety of races involved, it is a lot easier to draw assumptions about electoral trends from these state legislature races than from, say, a single US Senate or House special election. And the trending for Democrats at the state level this year is a lot better than it was in 2010. In the last three months, we’ve noticed a startling trend: Since March 1st, Democratic candidates have overperformed in almost every similar special election compared to the Democrats who ran in the same districts in 2010. This is a truly stunning turnaround. The conventional wisdom says that all else being equal (though it never is), a lower-profile election will produce a more Republican electorate. Therefore, a presidential year like 2008 should see better Democratic performance than a midterm like 2010, which in turn should see better Democratic performance than an odd-year special election. The DLCC analysis goes on to state that the Wisconsin Recall elections will provide a wealth more data to be added to the analysis. Even without the Wisconsin results, an average improvement in 9.7% in special elections is incredible. I mention this because here in Virginia Democrats seem to write off the House of Delegates. Even some of my favorite Delegate candidates speak of serving in the minority in Richmond. But by my estimation, there are no fewer than twelve seats in the House of Delegates that would have been flipped from Republican to Democrat in 2009, if the Democrat had won 9.7% more of the vote. That would have easily flipped control of the House of Delegates from Republicans to Democrats. And this is before Redistricting – Redistricting which has added even more seats from Democratic Northern Virginia. The first step towards winning a majority is starting from the belief that you can (though not necessarily will) win a majority. The analysis from the DLCC shows that there may be a wind at the backs of Democratic state legislative candidates, a wind that will blow into November for us here in Virginia. So let’s start talking like we’re going to win, because we can, and we should, and if we work hard enough to make it happen, we will. Later update: There’s a Washington Post article. 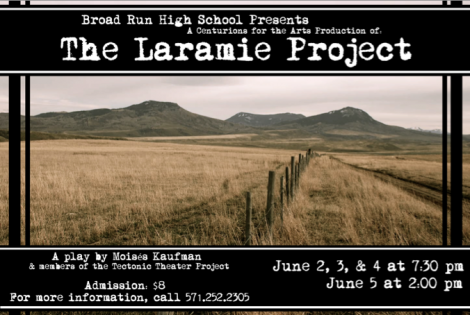 Update to the press release below: We are fortunate to have living in our community two people who were present in Laramie at the time of Matthew Shepard’s murder, and who became intimately involved in the unfolding story. Stephen Johnson, a minister whose Unitarian Universalist church provided the only safe space for GLBT people in the Laramie area, was the basis for a character in the play. Penelope Thoms was Matthew’s chaplain at the Fort Collins hospital where he died. Penelope tells of their experience here. They will be present for the Saturday, June 4 performance and discussion. This has been a funny year for Democratic politics in Loudoun. there are a lot of reasons, but none more annoying than the overwhelming preponderance of rumors. This candidate is switching parties (Not True). That candidate is moving Districts (Not True). This person is doing this thing to that other person (Not True). Last I checked, high school is over for most voters – and all active Democrats. That doesn’t stop the flurry of rumors from flying about, however. Now I know that this kind of intra-organizational gossip is simply a function of being human. What political organizations experience is not different from what dog breeding groups experience, in that manner. (And I was struck by the deep similarities of intra-organizational gossip between the two by being subjected to gossip from an example of each within fifteen minutes of conversations.) 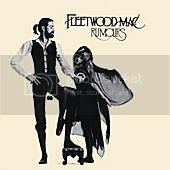 What is uniquely frustrating this year, however, is the depth of the rumors and the amount of sheer falsehood therein.